The reunion dinner before Chinese New Year is a very important event. It is more than just a meal; it is a time when family members who are scattered across the country and the globe return home and celebrate the reunion by feasting on mum. Scald chicken and spareribs in boiling water then drain well. 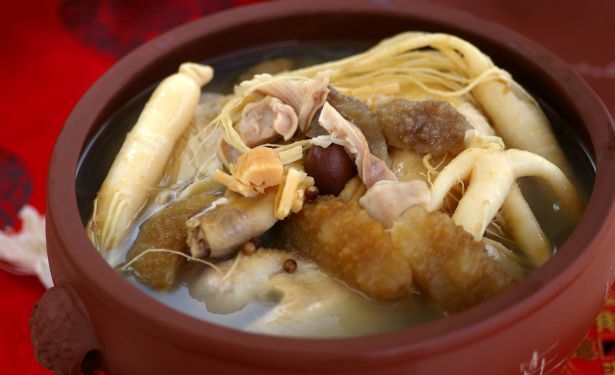 Place chicken, Chinese JinHua ham, spareribs and the rest of the ingredients except the abalone into a double boiler. Pour in water. Double-boil for 1 1/2 hours until all the meat is tender. Add sea-cucumber and continue to double-boil for 20-25 minutes. Adjust with salt to taste. Cut abalone into slices and add into the soup. Serve at once.